As seems to be the case in every even-numbered year, the San Francisco Giants were once again the National League Champions in 2014. Although the only got into the postseason as one of the two wild cards, the Giants were again able to call on their October magic and make it all the way through to another World Series title. 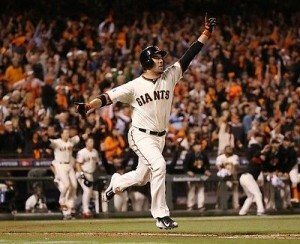 The most-memorable moment from their playoff run is likely the walk-off, series-ending homerun against the Cardinals by outfielder Travis Ishikawa. So, are the Giants a safe bet to head back for another World Series? Not so fast. With the loss of Pablo Sandoval, there will be questions about the offense in San Fran as the 2015 season get started. Here are some other National League teams worth paying attention to. The Nationals just might be the most-talented team in the entire National League – and maybe in all of baseball. With Bryce Harper anchoring a deep offense and an incredible pitching staff including the likes of Jordan Zimmerman and Stephen Strasburg, the Nationals are a team to be reckoned with for sure. Also playing in their favor is the fact that the rest of the National League East – specifically the Phillies and the Braves – figure to have down years. If the Nationals aren’t the best team in baseball, then it probably is the Dodgers. Another incredibly deep team, the Dodgers traded away former star Matt Kemp to the Padres and yet still have a powerful roster from top to bottom. The pitching staff is led by Clayton Kershaw, certainly the best pitcher in all of baseball. On offense, Adrian Gonzalez and Yasiel Puig are just a couple of the many threats that the Dodgers can send to the plate. The defending National League West champions are certainly going to be difficult to knock off of their spot at the top of the league. After one of the most-active off-seasons in baseball history, the Padres are going to be interesting to watch, if nothing else. They will feature a whole new outfield including the afore mentioned Kemp, Justin Upton acquired from the Braves, and Wil Myers who was received in a trade with the Rays. Despite the list of names that will fill the outfield, and the addition of James Shields on the mound, there are still serious questions about the quality of the infield that the Padres will be able to put in the lineup. Win or lose, few teams are likely to be as interesting to watch as the 2015 San Diego Padres. Beautiful President Ronald Reagan Single Signed National League Baseball.